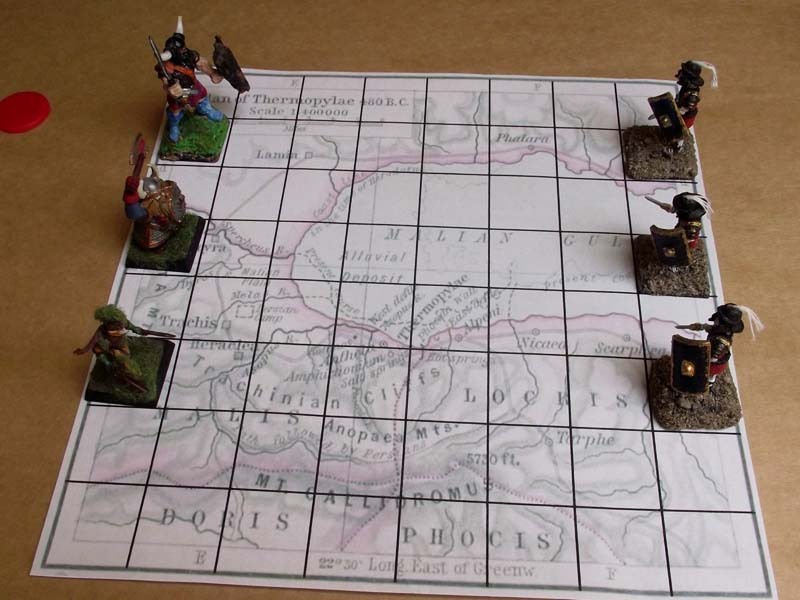 Thermopylae is my second (but first finished) entry to a Solo PnP Contest at Board Game Geek. In this game you will take the role of 300 Spartans who took their last stand against Persians at Thermopylae Pass, to protect retreat of the main body of Greek army. 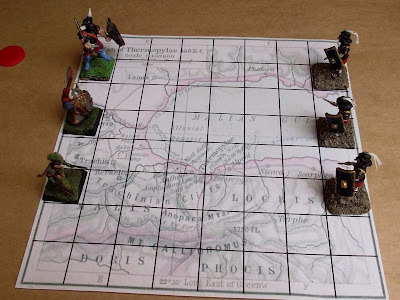 Game can be played by using given board and counters, but if the player wishes, it can be played with miniatures on the game board, or even with chess figures on chess table (this might be a good way to find a new use for your miniature magnetic chess set while on the road). If anyone is willing to playtest the game, link to rulebook is here. For those of you from Spanish speaking regions, here is the rulebook in Spanish, translated by Diego Roman. Counters are here, but you can use any miniatures you have, just as I did in the photos above. 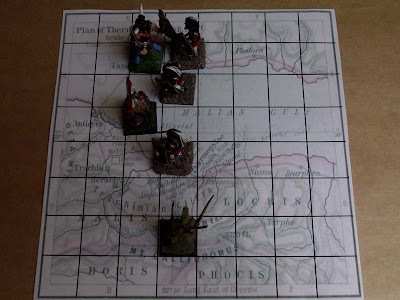 Chad Mestdagh made a Vassal mode for those of you who want to use it, and it can be found here. Other Vassal mode, made by Vassal Factory is here. A video review of the game can be found here. Thanks Igor! Please send me the files if you make some changes, I would very much like to see that! Nice, fun, and quick. Even played it a few times as a two-player game with another person in control of the persians. Only two things I would change about the rules. First would be to include some examples for the movement phase. I had to read it several times to make sense of it. Second, dice is the plural and die is the singular, you were using dices instead of dice and dice instead of die. Thanks Went, I will change that during the weekend!